The whole “cauliflower rice” thing has really caught on here in the USA, and why not? I mean when you can sub in a veggie that really does look and taste like rice, ups the veggie power of the meal, reduces calories ( 200 cal for a cup of rice vs. 35 for a cup of cauliflower rice) and carbs…well, ya!, that’s why it’s become such a staple. Which means that companies are jumping on the band wagon and making it really easy to buy already prepared cauliflower rice (either in the frozen food section or the bagged salad section of the grocery stores). Huge bonus! Oh course you can always make your own cauliflower rice too. More on how to do that here (Cauliflower Mushroom Risotto with Parmesan and Truffle oil). 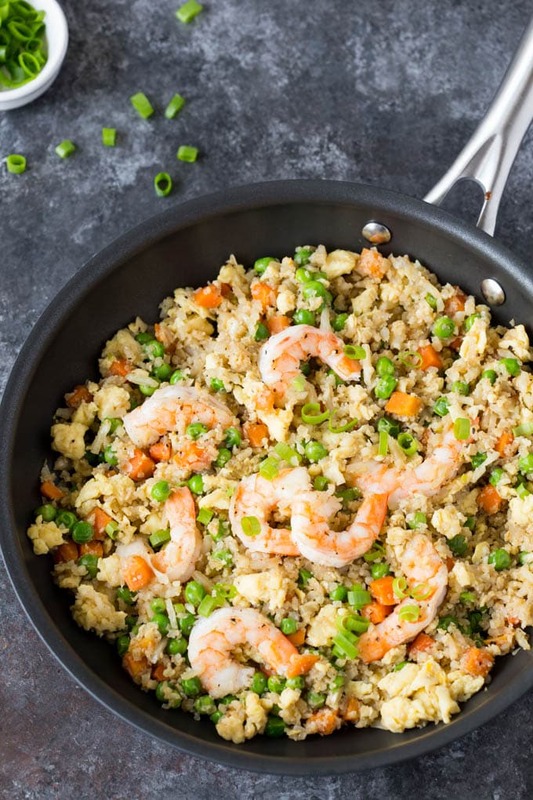 Whether you are using already prepared cauliflower rice ( like I did in this recipe) or making your own, this meal is going to come together in just a few minutes. After the shrimp have cooked you’ll return the pan to heat and cook the scrambled eggs. Set them aside with the shrimp and return pan to heat for the last time. Adding the garlic, ginger, onions, cauliflower, peas, and carrots. Cook until the veggies are just tender, careful not to overcook the cauliflower or it may get “soggy”. You want to the texture to be like rice. Add in the shrimp and eggs and soy sauce ( or coconut aminos if keeping things Paleo) and that’s it! 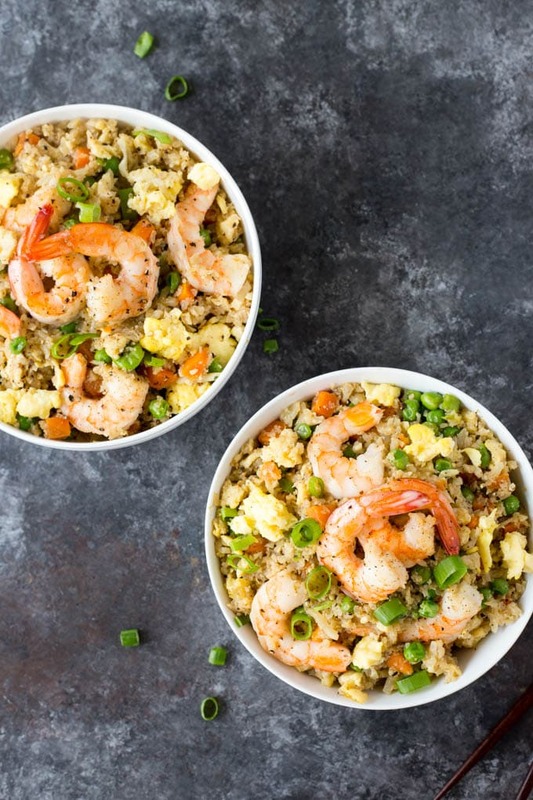 Your easy Shrimp Fried Cauliflower Rice dinner is now ready! Besides being easy to prepare, this dish is also very versatile. Swap in chicken or pork for the shrimp. 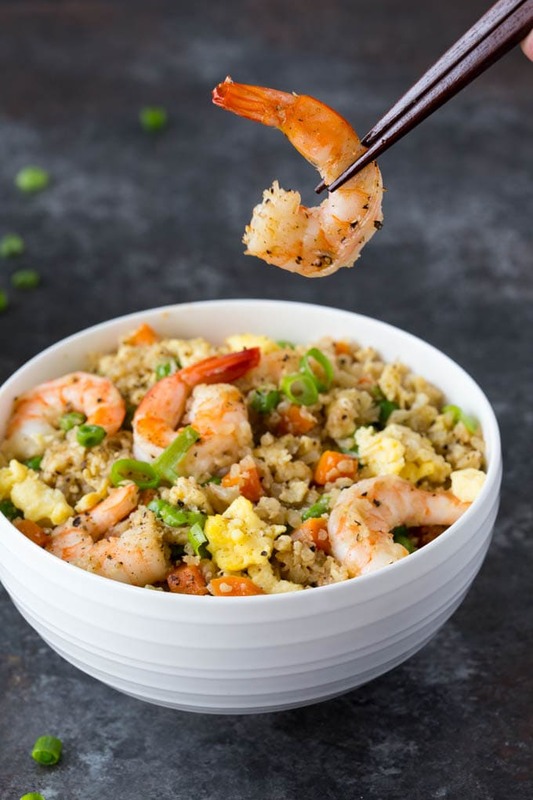 Or, omit the protein all together and serve as a side dish, it would be a perfect side accompaniment to Skinny Orange Sesame Chicken or Cashew Chicken. In a large non-stick skillet add 1 ½ tsp sesame oil and heat over medium-high. Add shrimp , and cook 2- 3 minutes ( until pink). Remove from pan and set aside. Return pan to medium heat. Add 1 ½ tsp sesame oil. ( if you prefer not to use oil, omit oil and spray pan with cooking spray). Add eggs and a pinch of salt and scramble until eggs are cooked. Remove from pan and set aside. 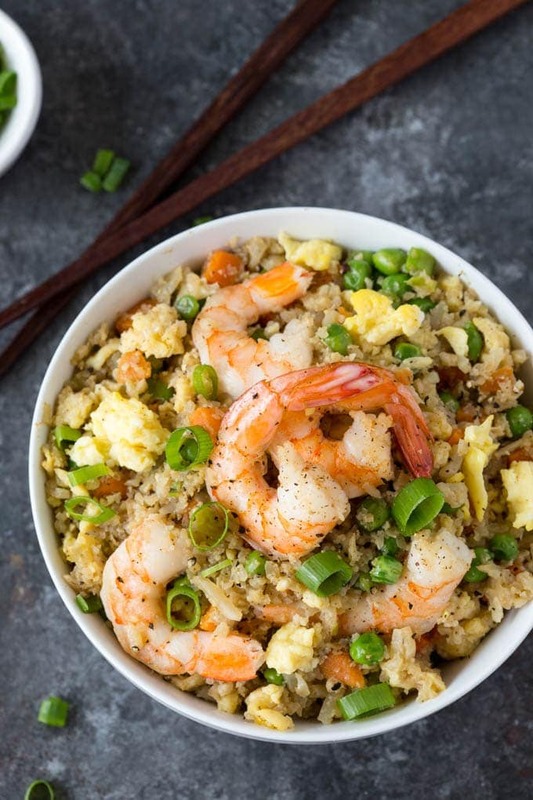 Stir in soy sauce(or coconut aminos) , shrimp, eggs, salt and pepper to taste. Top with green onions. **To make your own Cauliflower rice- Cut a large head of cauliflower into florets. In a blender (or food processor) add approx. 1 cup of the cauliflower florets and process for approx 15 sec. until the cauliflower is the consistence of rice. Transfer to a large bowl and repeat until the remaining cauliflower is processed. ( It's important to work in small batches when making the cauliflower rice to get even "rice" size pieces).